Swiss Franc is overwhelmingly the weakest one today with fresh selling in early US session. While Japanese Yen is also weak, it’s a relatively distant second. Both are pressured by extended rebound in global stocks. Meanwhile, additional pressure is seen on Franc from strong rebound in oil prices and emerging market currencies. Currently, both USD/TRY and USD/ZAR are down nearly -0.3%. Return of risk appetite is benefiting Australian Dollar most. Investors are cheering the deal in US Congress to avert another government shut down, with funding for 90km of bordering fencing. Also, there seems to be some quiet optimism on US-China trade talks. Though, US Treasurer Steven Mnuchin and USTR Robert Lighthizer arrived in Beijing today for trade talks, without any notable comments so far. Dollar and Euro are mixed for the moment. Sterling also stays mixed as UK Prime Minister delivered her Brexit update in the parliament. The most important thing to note is that if she cannot get an approvable new deal by February 26, the Commons will be given a chance to vote on a plan B on the following day. 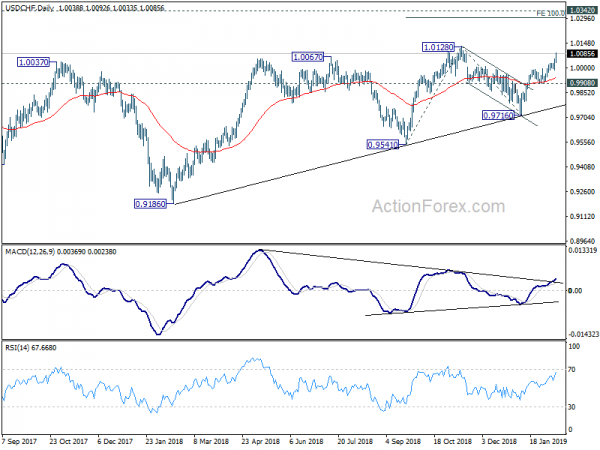 Technically, USD/CHF’s rally is accelerating towards 1.0128 key resistance. Break will confirm medium term up trend resumption. EUR/CHF’s break of 1.1376 minor resistance also suggests that pull back from 1.1444 has completed. Further rise is now likely through this level to 1.1501 key resistance. While AUD/USD is strong, upside is so far still capped by dovish RBA expectation. Further decline will remain in favor for the near term as long as 0.7107 minor resistance holds. In Europe, currently, FTSE is down -0.07%. DAX is up 1.03%. CAC is up 0.86%. German 10-year yield is up 0.0204 at 0.143. Earlier in Asia, Nikkei rose 2.61%. Hong Kong HSI rose 0.10%. China Shanghai SSE rose 0.68%. Singapore Strait Times dropped -0.16%. Japan 10-year JGB yield rose 0.0184 to -0.009, staying negative. US Treasury Secretary Steven Mnuchin and Trade Representative Robert Lighthizer arrived in Beijing today, ahead of the high-level meeting on Thursday. Mnuchin told reporters that “it’s great to be here back in Beijing,” and “we’re looking forward to several important days of talks.” Lighthizer arrived earlier but didn’t any any questions from reporters. UK Prime Minister Theresa May said in the parliament that she told European Commission President Jean-Claude Juncker last week that UK wanted “legal binding” changes to the withdrawal agreement that it would not be kept in the backstop. But Juncker insisted EU would not reopen negotiation on the withdrawal agreement. May told lawmakers such request for renegotiation was “reasonable”. But she also admitted that “some time” is needed to complete the process of negotiating a better deal on Irish backstop. Though, May is still aiming to leave the EU on March 29. She also promised that if she cannot get a deal by February 26, the Commons will have a chance to vote on a plan B the following day. For this week, it’s confirmed that there will be no meaningful vote in the Commons, but amendable motion for debate on Thursday. BoE Governor Mark Carney noted in a speech “The global outlook” today that global growth momentum is now “weakening in all major regions” and “downside risks have intensified”. Also, the proportion of the global economy growing above trend has fallen from four-fifths to one-third. USD/CHF’s rally accelerates to as high as 1.0092 so far today. Intraday bias stays on the upside for 1.0128 resistance. 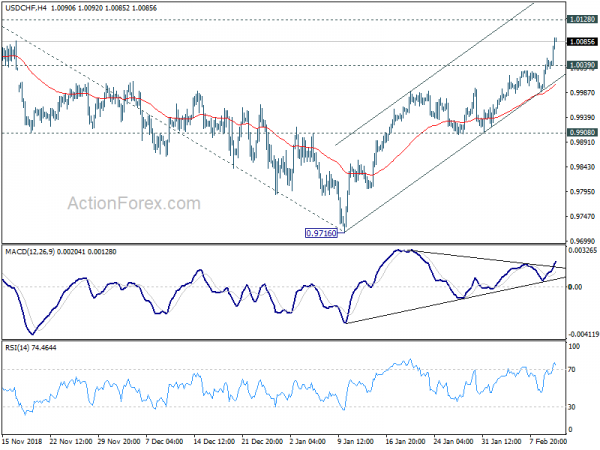 Decisive break there will confirm resumption of up trend from 0.9186. Next target will be 100% projection of 0.9541 to 1.0128 from 0.9716 at 1.0303. On the downside, below 1.0039 minor support will turn intraday bias neutral first and bring consolidations. But retreat should be contained well above 0.9908 support to bring another rally.